What real advan­tages are there when spend­ing extra money on an expen­sive lens over its cheaper counterpart? When com­par­ing pro lenses to the ‘cheaper’ lenses, the higher priced lenses deliver bet­ter qual­ity for the most part. 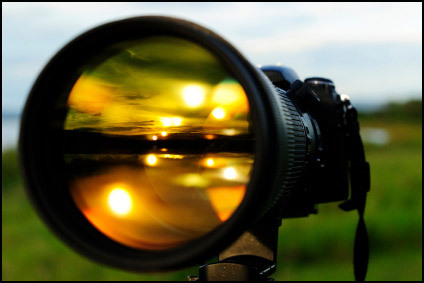 Depend­ing on the lens you might also get expe­dited auto-focus, sharper images and less chro­matic aber­ra­tion.‚ Per­haps the biggest advan­tage though is with regard to aper­ture. More expen­sive lenses are often faster. This means that their largest F-stop (small­est num­ber eg. F1.8, F2.0, F2.8 etc) is usu­ally larger than cheaper lenses. Remem­ber, the larger the aper­ture, the more room you have to use a faster shut­ter speed. In addi­tion, the larger the lens’s aper­ture, the eas­ier it is to shoot in lower light because when you look through the viewfinder you are look­ing at a scene through the lens’s largest aper­ture. If a lens has a max aper­ture of F2.8, any scene you look at through your viewfinder will look BRIGHTER than if the lens’s widest aper­ture was F4.0. It makes no dif­fer­ence what F-stop you use dur­ing the actual expo­sure. This doesn’t make a dif­fer­ence in bright sun­light, but in makes a huge dif­fer­ence in low light where it is eas­ier to focus if the viewfinder is brighter. On the neg­a­tive side, higher priced lenses with larger aper­tures will often‚ buy you sig­nif­i­cantly more ‘weight’ as well. When com­par­ing the results of pro lenses to the ‘mid-range’ priced lenses (pro-consumer level), there doesn’t seem to be a notice­able dif­fer­ence to many advanced pho­tog­ra­phers so long as the images are kept small. This is espe­cially true if the images are for Inter­net use only. If you’re still skep­ti­cal and want to test the waters your­self, you can always take the same pic­ture using two dif­fer­ent lenses to prove a point. Or, an eas­ier route is to search the web for some­one who’s already taken the time to do it — much easier! When you’re just learn­ing though you can eas­ily learn on a used or lower end DSLR that you’ll surely replace as tech­nol­ogy changes. The lenses though, you can keep those for decades. Trust me, spend the dough on the lenses. Check out the link in our pho­tog­ra­phy forum for more info.